Starting with release 1708, we are happy to announce the availability of the mobile channel for SAP Hybris Marketing Cloud. A marketer can now create a mobile campaign in SAP Hybris Marketing Cloud system and send marketing offers and notifications to mobile devices. The graphic below illustrates the end-to-end flow for enabling the mobile channel feature. You can create a mobile campaign in SAP Hybris Marketing Cloud system. To this campaign, you can assign an offer or a notification. The offers and notifications are sent as mobile push notifications to either Android or iOS devices. The mobile push notifications are routed via Google Firebase. 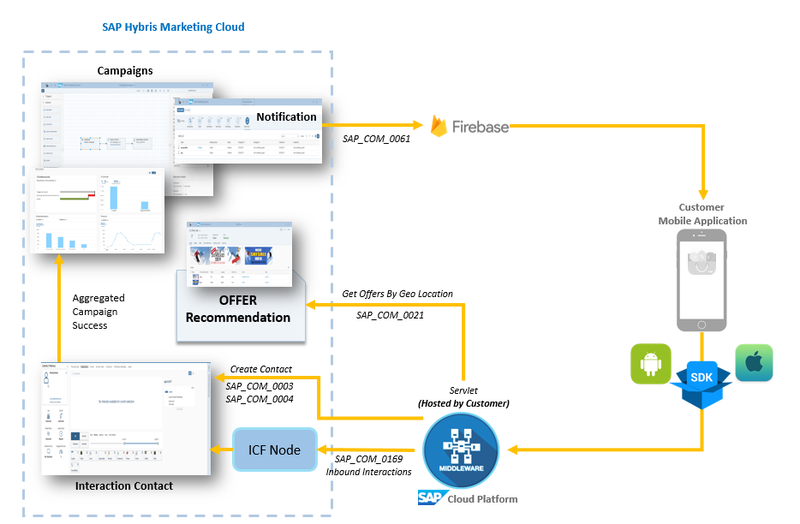 For the mobile device to connect to SAP Hybris Marketing Cloud system, you need to install the servlet and mobile SDK provided by SAP. The mobile SDK will help you to quickly build and enhance your mobile application. Depending on the type of mobile device you use, Android or iOS, you can download the SDK from here. Use the servlet to authenticate and transfer calls from your mobile application to SAP Hybris Marketing Cloud system. You can download the servlet from the here. You need to deploy this servlet on SAP Cloud Platform. The API calls configured in the mobile application need to point to the deployed servlet. Once you have installed and setup the Servlet and the Mobile SDK, you need to set up the communication scenarios for inbound and outbound communication. For more information, refer to the Integration guide. Create a Mobile Campaign in SAP Hybris Marketing Cloud, using the action Mobile Push Notification. To this action, assign a notification text or an offer. For more information on how to create mobile campaigns, see here. The target group can be created will all mobile device users. (Use ID_Origin as MOBILE_APP_TOKEN). This will pick all the contacts within SAP Hybris Marketing Cloud system that have installed the mobile application and registered their user on the mobile application. Once the user registers on the mobile application, a call is made to SAP Hybris Marketing system to create a contact. The contact will then have the ID_Origin as MOBILE_APP_TOKEN. Once the campaign is executed, push notifications are sent to the mobile devices of the contacts – via Google Firebase. Once the users receive the notification, they can click on it to view the offer in the mobile application. Hope you try the solution and enjoy your mobile endeavor with SAP Hybris Marketing Cloud! You can now download the mobile SDK (iOS and Android) and servlet for 1709 release from the SAP Document Center. Does this work for Hybris Marketing 1708/1711 Cloud Edition? Is the servlet required? How do Push notifications work on previous versions? Thank you for your interest in our Mobile Channel solution. Yes, the solution does work for both 1708 and 1711 cloud editions. Yes, the servlet is required. If you have any further questions, please feel free to connect with sreejith.govindan@sap.com. Visitor visits the web shop which ask for permission for push notification. Than the hybris marketing sends push notifications to the browser with promo messages. Is it possible in hybris marketing On premise? The link (click here) provided in the above blog points to various versions of SDK. You can choose the required folder depending on the release you are on. For example, if you are using SAP Marketing Cloud, the latest version is 1902. If you are using an on prem version, the latest version would be 1809. Each folder contains the Android/iOS files for SDK. Thanks a lot for your response. The link shared points to internal SAP private links which I don’t have access to. But is fine, I managed to get the access to those documents and have downloaded the SDKs and handed over to the Web Dev team. We face another issue now as below. Kindly advise. Currently, we are working on Hybrid application using Phone gap technology which is highly recommended to access native functionality via cordova/phonegap only. The SDK document shared is for native mobile application. Does Marketing Cloud support Hybrid mobile application using Phonegap/Cordova Technology? Please try this link where I have provided access to “anyone with link” to access the docs folder. Also, for your question, I believe, Sreejith Govindan will be able to help you with an answer.